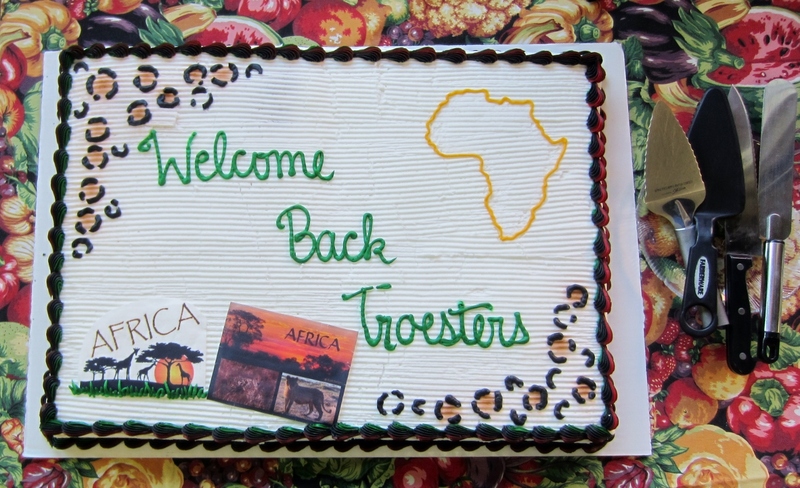 We have returned to Africa from an enjoyable but exhausting two month tour of the United States. We traveled over 8000 miles in the U.S. by car, train, and plane and were able to visit our friends, relatives, and supporters in Illinois, Minnesota, North Dakota, New York, Ohio, Pennsylvania, and Wisconsin. We sincerely regret that time did not allow us to visit our friends and supporting churches in Florida and Puerto Rico. During July and August, we had 15 separate engagements, including visiting 11 different congregations plus attending the ELCA-GM Summer Mission Conference and a Global Mission Gathering in the Upper Susquehanna Synod. The response to our presentations was positive and enthusiastic. We were even written up in our hometown newspaper, The Southern Illinoisan. The only event that marred our visit was the death of our dear friend and long-time supporter, Rev. Martha McCracken, of Jersey Shore, Pennsylvania. When she was pastor of Grace Lutheran Church in San Juan, Puerto Rico, Martha was the person responsible for connecting us with Global Mission. We had planned a visit with her in Jersey Shore, but sadly she was already hospitalized in serious condition at that time. She passed away on August 31, 2015. She will be greatly missed by all who knew her. Now we are back in Arusha, Tanzania and have returned to our duties as the ELCA Regional Representatives in East Africa (Tanzania, Kenya, South Sudan, and Uganda). After visiting a few more university campuses, our daughter Christa will be spending a gap year with us between high school and university. We want to thank all of the people that helped us with our travels, by providing delicious homemade specialties, giving us a comfortable place to sleep, and patiently listening to our stories and presentations. We made many new friends and renewed many old acquaintances. We look forward to seeing you all again the next time we return to the States. Below is a detailed list of all our engagements. A copy of our PowerPoint presentation is available upon request. List of presentations during our 2015 Home Assignment. · July 12, Sunday morning: Deborah preached at Christ Community Church in Columbia, Illinois and we gave a presentation afterwards. · July 16: We gave our presentation at Giant City State Park for the Supper Club of First Presbyterian Church in Carbondale, Illinois. · July 19 to 24: We attended the ELCA-GM Summer Mission Conference at North Central College in Naperville, Illinois. · July 25: We gave our presentation for the Meru Committee of the Greater Milwaukee Synod, in Shorewood, Wisconsin. · July 26: Sunday morning: Deborah preached at Resurrection Lutheran Church in New Berlin, Wisconsin and we gave a presentation afterwards. · July 27: We met with Rev. Doug Cox, Rev. Tim Iverson, and Scott Lien of Global Health Ministries in Minneapolis, Minnesota. · July 29: We gave a presentation at Our Savior’s Lutheran Church in Rolla, North Dakota. · August 2, Sunday morning: Deborah preached at Salem Evangelical Lutheran Church in Jonesboro, Illinois and we gave a presentation afterwards. · August 2, Sunday evening: We gave a presentation at Epiphany Lutheran Church in Carbondale, Illinois. · August 8, Saturday evening: Deborah preached at Trinity Evangelical Lutheran Church in Camp Hill, Pennsylvania. · August 9, Sunday morning: Deborah preached four times at Trinity Evangelical Lutheran Church in Camp Hill, Pennsylvania and we gave a presentation afterwards. · August 16, Sunday morning: Deborah preached at Zion Lutheran Church in Penn Hills, Pennsylvania and we gave a presentation afterwards. · August 16, Sunday evening: We gave a presentation at Prince of Peace Lutheran Church in Poland, Ohio. We spent the rest of the evening and next morning with Stu Smith, a hydrogeologist that I have worked with in both the Dodoma Diocese and the Meru Diocese in Tanzania. · August 17: We gave a presentation at St John Evangelical Lutheran Church in Oak Harbor, Ohio. Our presentation was attended by Bishop Lohrmann, Northwestern Ohio Synod. · August 22: We gave a presentation at a Global Mission Gathering for the Upper Susquehanna Synod at Christ Lutheran Church in Milton, Pennsylvania. · August 23, Sunday morning: We gave a presentation and Deborah preached at St. Michael Lutheran Church in Cogan Station, Pennsylvania. 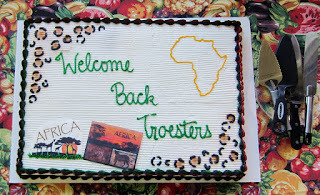 Photo Caption: Epiphany Lutheran, in Carbondale, Illinois, welcomed us home with this cake. Joe and Deborah are missionaries in Arusha, Tanzania, where they are the East Africa Regional Representatives for the Evangelical Lutheran Church in America and work in Tanzania, Kenya, South Sudan, and Uganda. Their daughter, Christa, is taking a gap year with us in Tanzania between high school and university.